This week, there were two new developments supporting two different theories of what happened to Amelia Earhart. Richard Gillespie, head of the International Group for Historic Aircraft Recovery, makes the case for one of them. Eighty years ago this week, Amelia Earhart and navigator Fred Noonan took off from Lae, New Guinea, for what should have been one of the last legs of their around-the-world flight. 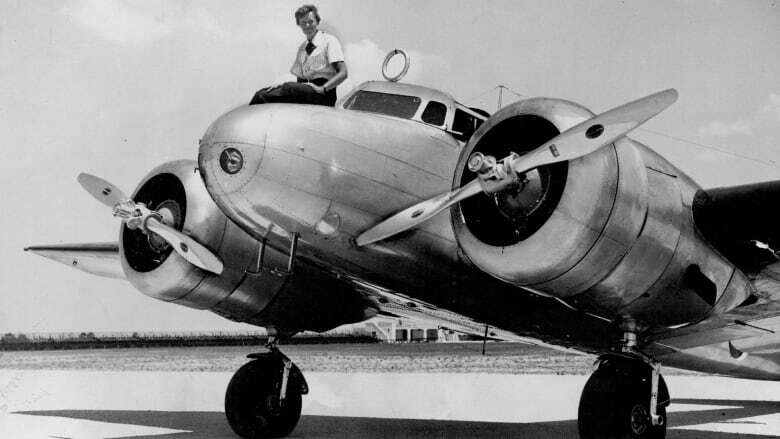 Earhart was trying to become the first woman to pilot an aircraft around the world, but when the Lockheed Electra 10E disappeared without a trace on July 2, 1937, her disappearance became her legacy and it remains one of the greatest mysteries of our time. Earhart and Noonan were scheduled to touch down on Howland Island, an uninhabited coral island in the central Pacific Ocean. But it's believed they went off course and couldn't find it, and no one has been able to find them in the eight decades since. Some people think they ran out of gas and crashed in the ocean. Other theories have Earhart and Noonan living out their last years as castaways on a remote island. There are even suggestions that they were taken hostage by the Japanese military and died while in custody. This week brought new information that supports two of these theories. On the castaway front, researchers spent this week searching a speck of land 650 kilometres southeast of where Earhart was supposed to land. The eight-day expedition included The International Group for Historic Aircraft Recovery (TIGHAR), the tour company Betchart Expeditions and National Geographic, who brought a team of forensic dogs with them. The four Border collies — Berkeley, Piper, Marcy and Kayle — are adept at sniffing out human remains and represent the first canine unit used in the search for Earhart's remains. The researchers know this island was home to an American castaway in the 1930s. The mission now is to prove it was Earhart. Ric Gillespie is the executive director of TIGHAR, and as he tells Day 6 guest host Jelena Adzic, the dogs made a meaningful discovery a few days into the mission. "The dogs have been successful in identifying the spot at the castaway campsite where the castaway's bones were found," he says. "They alert on the scent of the chemicals that result from human decomposition. So, the body laid there and decomposed and essentially stained the ground". 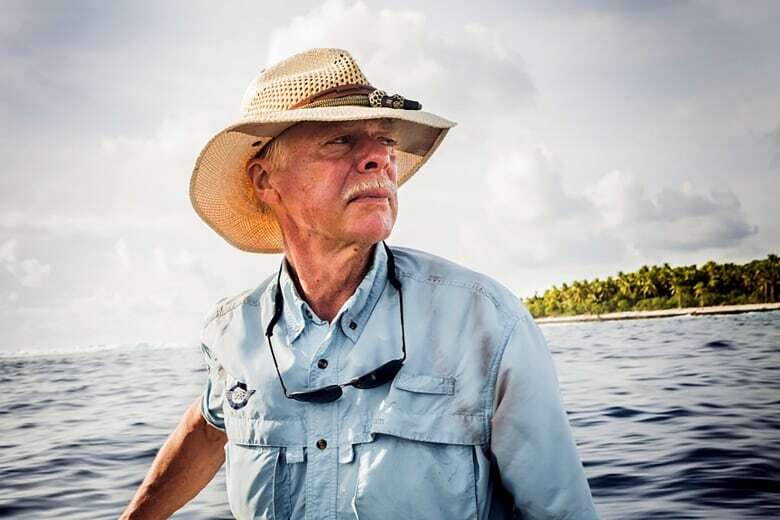 Gillespie believes the coral atoll of Nikumaroro, part of the Phoenix Islands of Kiribati, is the right spot. His organization has already mounted eleven prior trips there. He says it's a matter of narrowing the search until they find something conclusive. While the dogs searched the land, TIGHAR focused on the water. Gillespie and members of his organization believe there are remnants of The Electra in the coral reef. "If we can find a piece of her airplane — and I think we can if we keep trying hard enough — that should do it. That should be the smoking gun everybody says they're looking for." 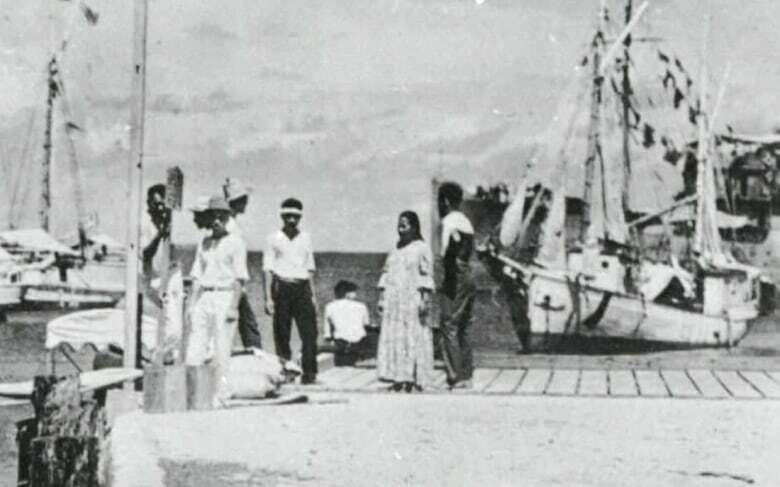 On Wednesday morning, NBC's Today Show unveiled a newly discovered photograph that suggests Amelia Earhart survived a crash-landing in the Marshall Islands. The undated photo shows a group of people on a dock at Jaluit Atoll. 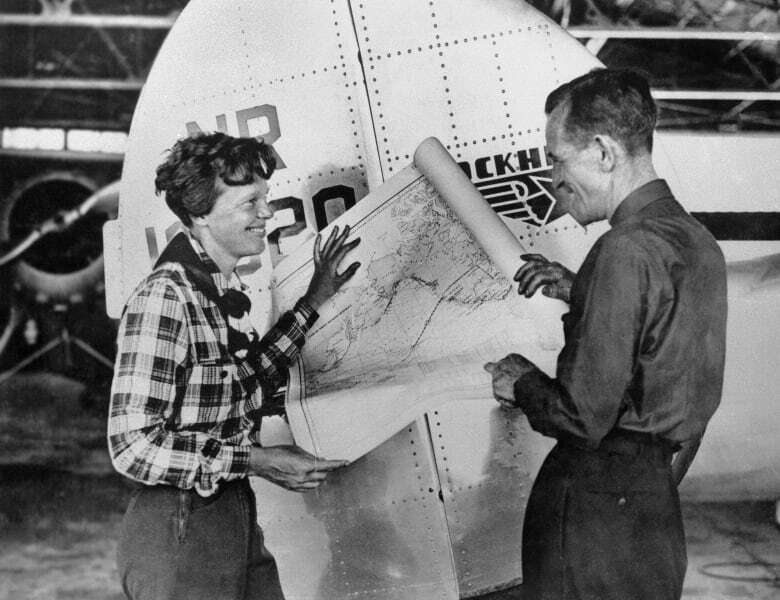 A woman who resembles Amelia Earhart is sitting in the centre of the image with her back to the camera, and a man who resembles her navigator, Fred Noonan, stands nearby. If verified, the photo lends credibility to the theory that Earhart and Noonan were captured by Japan for being suspected spies, and died in custody. Gillespie says he's known about the photo for more than a year and he doesn't influence his theory in any way. "If this is a picture of her in Japanese custody, where are the soldiers? No one in that picture is wearing a uniform. Nobody has a gun. Nobody is acting tense, like they're guarding prisoners. They're just standing around," he says. The photo was discovered in the National Archives and will be featured in a new History channel special called Amelia Earhart: The Lost Evidence, which airs this Sunday night. For Gillespie, it suggests that there is an immense appetite for anything related to Amelia Earhart. "As somebody who's spent 28 years investigating this mystery and insisting upon very high standards of evidence, to see this kind of attention being paid to something this trivial and inconsequential is … well, we live in an age in which conspiracy theories are popular and it's maybe not surprising," he says. The Japanese abduction theory dates back to the 1940s and a film loosely based on Earhart's story. 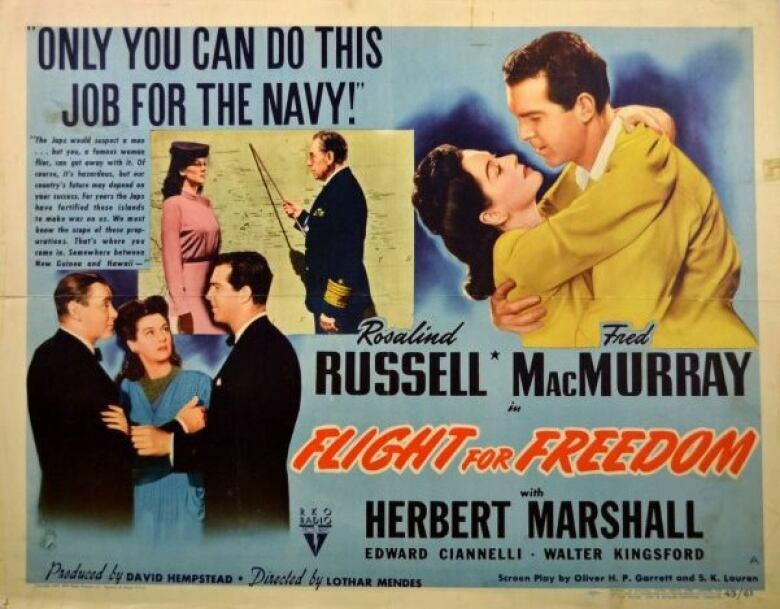 Flight for Freedomstars Rosalind Russell as female pilot Tonie Carter and Fred McMurray as her navigator Randy Britton. IMDB describes the film as: "The life of air pioneer Amelia Earhart is given a fictionalized treatment, with a speculative conclusion." That 'speculative conclusion' sees the Earhart character intentionally crash in the Marshall Islands as part of a secret mission on behalf of the U.S. government. When Ric Gillespie and his wife started TIGHAR in 1985, he had no intention of immersing himself in the search for Amelia Earhart. But he has. Now he is convinced that she spent her final days spearing fish and boiling water in bottles she salvaged from her airplane. 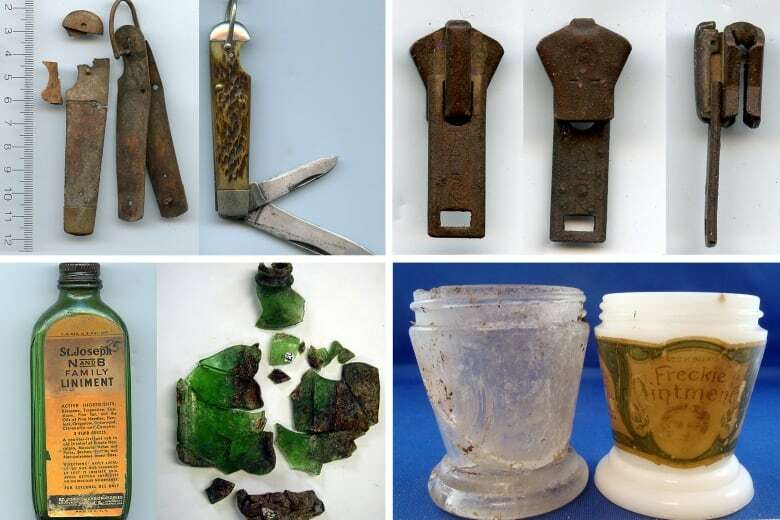 The International Group for Historic Aircraft Recovery says it has found artifacts on Nikumororo that closely resemble goods produced in the United States during the 1930s. These include a jar of freckle cream and jack knife like the one issued to Earhart. "We have so much evidence from so many different types of investigations and different sources that all point to the same conclusion," he says. "If you go back and look at the newspaper headlines from 1937, when she disappeared, as you'll see is that Amelia's radio calls for help are being heard night after night after night and the conclusion is she's out there on an island some place. She's trying to survive." He says that her disappearance is more of a mix up than a mystery because her distress calls were heard, but the Navy couldn't pinpoint their origin and eventually dismissed them as a hoax. Meanwhile, according to Gillespie, Earhart was on Nikumaroro, with her plane, until the tide washed it away. "I understand that this is an iconic mystery and that the bar is set very high, and it's not enough for me to be convinced, so we need as much evidence as we can possibly put together and that's what we're trying to do." To hear guest host Jelena Adzic's interview with Ric Gillespie, download our podcast or click the 'Listen' button at the top of this page. And if you have information about Amelia Earhart's disappearance, email Ric at info@tighar.org.